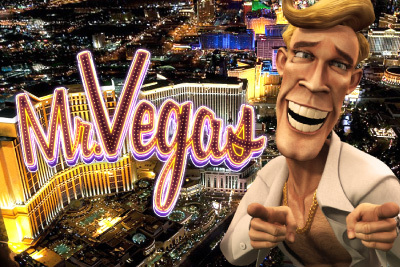 As a slots player it’s hard not to love Mr Vegas mobile slot from BetSoft. Representing all that’s best about the city of sin, in the glamorous fabulous side of Vegas we all wish we could experience. Allow High Roller Mr Vegas show you the best of what this city has to offer, from roulette, craps, slot machines and money wheel bonus rounds. These are some of the best and very creative slot bonus features, which lose very little from the original online slot game. You’ll find no standard slot symbols here. They have been replaced with Mr Vegas and his friends. Along with the main characters you’ll find a roulette wheel, welcome to Las Vegas sign, a pair of cards, a stack of poker chips and of course it wouldn’t be Vegas without a little champagne and show girls. Beware, this BetSoft game is highly graphical and even when connected to WiFi, the bonus round requires some downloading time. Not a problem most of the time, but if your internet on your Android phone or iPhone isn’t at its peak, this mobile slot machine can be slow and loses much of the fun. Free Spins: If the dice symbol lands on either side of the Mr Vegas icon on paylines 1, 2 or 3 you’ll receive the dice amounts corresponding free spins. If you’re lucky enough to roll double you’ll earn double the amount on any wins during the free spins. Slot Machine Bonus Round: Get three or more of these icons to unlock a free mini 3 reel, one payline mini slot game. The odds of getting much out of this feature are small, but when you do it’s a decent amount of free spins or credits. The Money Wheel: Get five or more slabs of the money wheel anywhere to unlock the money wheel bonus round. Let the glamourous showgirl spin the wheel for you and get a whole variety of different prizes. And we are not talking just free spins, bonus rounds or free credits here. This is where you get a chance to win at that growing progressive slot jackpot featured on Mr Vegas. Spin and win baby. Roulette Bonus Game: Get the Mr Vegas icon on any position on the 1st payline on reels 1, 3 or 5 to play roulette Vegas style! Pick three numbers for Mr Vegas and watch the wheel spin. Your chances of winning are about as much as on roulette, but boy does it feel good when it does. Play Mr Vegas slot machine on mobile and it will soon become a firm favourite with a great payout, wonderful features and a universal theme that all slot players should enjoy. Loses a star simply due to the fact you need excellent WiFi connection to enjoy this Betsoft jackpot slot at its best.